Wavy Pizza Cutter | Kitchen Tools(KEB-211) - Keywood International Inc. This rolling blade cutter is the perfect kitchen tool for cutting pasta and pizza. The wavy blade creates unique patterns on dough, suitable for lasagna and other pastas. Sharp, high carbon blade for effortless cutting. Handle has slot for hanging when drying or not in use. 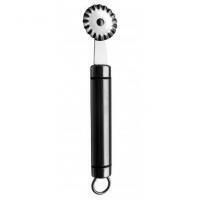 Ideal for flipping meat patty, fish fillet, eggs, and sauteed vegetables.